Expectations are usually different than reality. 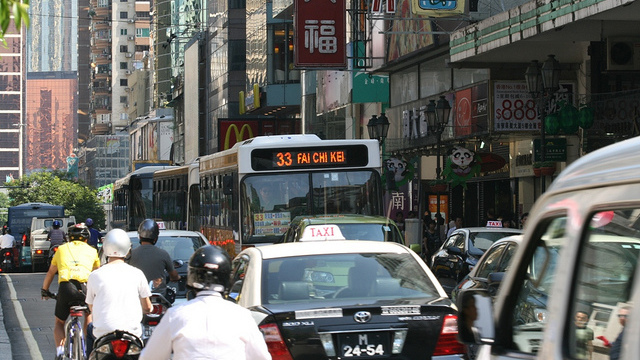 To minimize a cultural shock, I checked several videos, browsed the internet and tourist guides about Macau. I also met two students from Macau in Sweden before my exchange. However, a lot of things surprised me immediately after arrival to this former Portuguese colony. First, cars are going on the left. I don’t know if I was blind or there were no cars in the videos about Macau but I overlooked this detail. I was quite surprised when a car almost bumped into me on the first zebra crossing. Second, I read that it is not advisable to swim in the ocean because it is dirty. I thought this claim was exaggerated but it is true unfortunately. Macau lies in the delta of the river Pearl which brings a lot of mud. I would say that the river Morava in my city Olomouc in the time of floods is as comparably “clean” as the ocean in Macau. It seems I will not enjoy swimming in the ocean as I looked forward. Third, weather is not that bad. 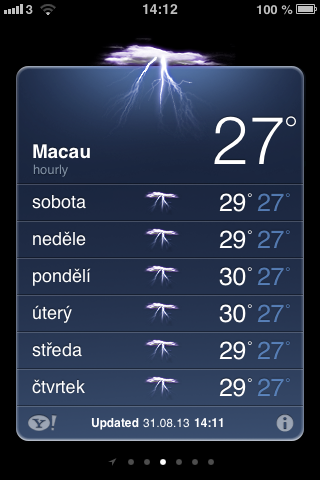 After I was accepted to the exchange, I added Macau to my weather app on my mobile to check it regularly. During the whole holidays, the app showed the same picture. So does it now. The monsoon period is supposed to end at the end of September and it usually brings around 200 mm of precipitation that month (compared to 40 mm in Prague) so I expected a non stop rain. However, it is quite ok. It usually rains every day but just around 3-4 hours. In the rest of the time, it is cloudy or sunny and you can go out. Anyway, weather is very changeable. I would compare it with British weather but here are storms instead of light rains. Temperature is stable around +30, 90% moisture during the day and also the night. Local people are ready for this climate. They wear umbrella all the time against both rain and the Sun. Fourth, our dormitory is amazing. I was scared we would be living in some typical tiny Chinese flat in the 50th floor. 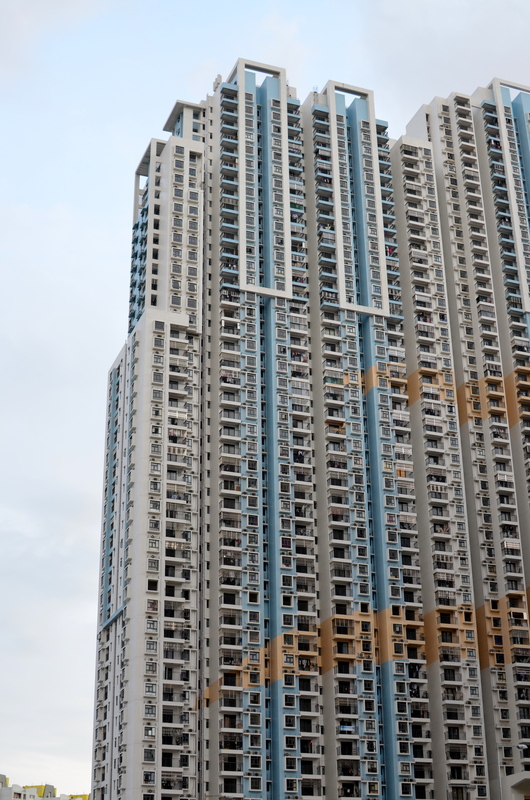 I was also said that Macau dormitory is pretty strict. You can’t enter the dormitory after 11 and internet is turned off at midnight. However, my disconcertion was unnecessary. Our campus is situated in the main casino area. To enter the largest casino in the world “Venetian”, we just have to take a five-minute walk. I live in a corridor with all other Erasmus students in the first floor and I entered into a large room which is well equipped. We live in pairs. We have our own toilet and shower. Later, I found out that our room usually serves visitors as a hotel. It is nice to be a worthy visit from Europe. In addition, there are no rules for us. We can go out anytime we want and internet works all the time. (Note: Facebook and other “dangerous” pages are working here normally. The firewall is only in mainland China, not in Macau). Fifth, people don’t speak English. That’s what I really haven’t expected from a European colony. It is pretty cheap to eat out so I often go with my new friends to a restaurant or in the university canteen. As nobody understands us any single English word, we use here a picture language to order something to eat. We just take a picture with our smartphones of a food in the offer which we regard as the least dangerous and we show the picture to the waiters. Anyway, the picture communication together with mime often brings very funny situations. I am glad this works for now but I look forward to the beginning of Chinese language course and I hope I will be able to order something myself. These five things surprised me mostly. It is important for me that it looks safely here. Here are no insects or other animals which we should be scared of. You can find just a lot of snails here as they like rainy weather. Chinese people are very kind. After we get used to Chinese cuisine, everything will be alright. To sum up all the first impressions, I think it will be a very interesting five-month stay here. This entry was posted on Tuesday, September 3rd, 2013 at 10:44	and tagged with Macau, Umeå School of Business and Economics (USBE) and posted in Macau University of Science and Technology. You can follow any responses to this entry through the RSS 2.0 feed. « NTU Summer+ Program: The Asian Adventure Begins!